I am following Nathans blog with great interest. I keep asking "when will Israel ever consider themselves to be at peace?" "I am following Nathans blog with great interest. I keep asking "when will Israel ever consider themselves to be at peace?"" Consider that in the aftermath of the Pslam 83 war (which foretells of the total defeat by Israel (i.e. the IDF) of all the opposing military forces in Lebanon, Syria, Jordan, Saudi Arabia and Egypt), that Israel will no long have a state of perpetual war nor have to endure the existence of the present islamic terrorist threats from within. 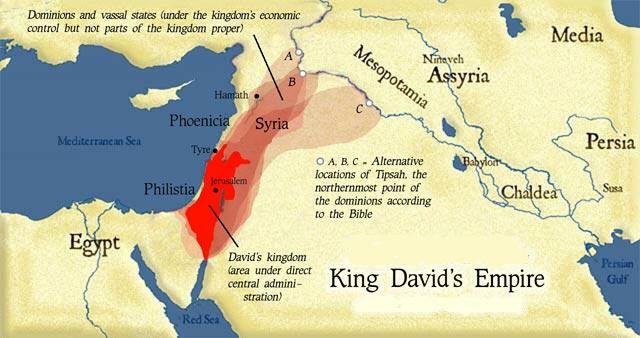 In the aftermath of this war Israel's boundaries will be very much like those of King David's Israel. You wrote "...but a setup by God who utterly destroys them with violent weather." After all, most people have already swallowed Global Warming causing large scale destruction. Could that be it..."ah, it wasn't God, it was Global Warming!" Could I be on to something? Billy, what the Bible describes could only be attributed to the God of Abaraham, Isaac, and Jacob. There will be a massive earthquake that levels mountains along with a torrential flooding rain, massive hailstones, fire and brimstone falling from the sky (See Ezekiel 38:20, 22). There is absolutely no way that anyone with half a brain could say, "Oh, that. That was global warming." Even though I'm some will. Thanks, thunder. Though honestly, if you had seen that program I reference you would not be surprised if a secular world does it's best to write off this as caused by "mother earth" instead of God. My point is, if it's on NatGeo, History, or Discovery, the main goal is to try to debunk the Bible. (Notice, they never try to debunk the Qu'ran or any other religious writing). This is what so-called scientists do. They try to explain away God because they know that there is a God and they are answerable to Him (Romans 1). So, using their logic, if they don't admit there's a God they are no longer answerable to Him. Out of sight out of mind. That's why I said people with half a brain. People who are honest with themselves will have to admit something beyond the natural has happened in Israel on that fateful night. This is why there be a return (I think) to temple worship in Israel: They know it is God who saves them. Thunder, thanks for the clarification. Your statement "So, using their logic, if they don't admit there's a God they are no longer answerable to Him. Out of sight out of mind" makes sense to me and explains a lot! Don't thank me, Billy. Thank God. I just took what the Apostle Paul penned under inspiration from the Holy Spirit and paraphrased it a little. As Darryl Waltrip says, "It's about to get 'citin', boys." It is truly amazing to me how people stubbornly refuse to acknowledge God. In addition to the miracles that have been "explained away" as others here have pointed out, I'm always amazed that it is only the Lord's name that's taken in vain. Why don't you ever hear someone "blaspheming" Buddha, Allah, Mohammad, or some other god (which is really no god at all)? It's because this is an attack by the devil on the one and only true God! All those others are in league with Satan! The discovery of a major natural gas field off the coast of Israel could help make the country an energy exporter" Quote from Business Week. Another possibility, After a war that well may be nuclear resulting in the total destruction of Damascus and the northern areas of Israel, Israel may well be the owner of the world's energy supplies. Sure would be tempting to Russia. Sean Osborne says, "Consider that in the aftermath of the Pslam 83 war (which foretells of the total defeat by Israel (i.e. the IDF)"
You are doing what you constantly accuse others of doing Sean - adding meaning to the text that isn't there. It is quite clear in Psalm 83 that any defeat will be accomplished by the hand of God, not Israel. Where is it in the text stating that it is Israel who will be the ones defeating the Islamic nations? The answer is nowhere, because it isn't there. Psalm 83:13-17, "Make them like tumbleweed, O my God, like chaff before the wind. As fire consumes the forest or a flame sets the mountains ablaze, so pursue them with your tempest and terrify them with your storm. Cover their faces with shame so that men will seek your name, O Lord. May they ever be ashamed and dismayed; may they perish in disgrace." And here's the kicker - Psa 83:18, "Let them know that you, whose name is the Lord-- that you alone are the Most High over all the earth." This will only be accomplished during the Second Coming of Christ when He destroys the invading Islamic coalition of nations. Besides, if Israel were the ones to defeat them again these Islamic nations still would not know that the God of Israel is the Most High. They didn't get it in 1948, they didn't get it in 1967, and another loss wouldn't change their minds a third time either. They would make up more excuses again. Only a supernatural destruction will convince them. Zech 12:9, "And it shall come to pass in that day, [that] I will seek to destroy all the nations that come against Jerusalem." This is Armageddon, when God gathers all of the surrounding nations to be destroyed and show the world that He is God. Zechariah 14:14 "... and the wealth of all the surrounding nations will be gathered, gold and silver and garments in great abundance." Zechariah 12:2 "I am going to make Jerusalem a cup that sends all the surrounding peoples reeling..."
Joel 3:11-12 "Hasten and come, all you surrounding nations, And gather yourselves there. Bring down, O LORD, Your mighty ones. Let the nations be aroused And come up to the valley of Jehoshaphat, For there I will sit to judge All the surrounding nations." 4 "Now what have you against me, O Tyre and Sidon and all you regions of Philistia? Are you repaying me for something I have done? If you are paying me back, I will swiftly and speedily return on your own heads what you have done. 5 For you took my silver and my gold and carried off my finest treasures to your temples. 6 You sold the people of Judah and Jerusalem to the Greeks, that you might send them far from their homeland. 7 "See, I am going to rouse them out of the places to which you sold them, and I will return on your own heads what you have done. 8 I will sell your sons and daughters to the people of Judah, and they will sell them to the Sabeans, a nation far away." The LORD has spoken. so great is their wickedness!" Hi Gideon, I'm not sure what point you're trying to make, so I'll need you to explain it to me please. The verses that you posted are all pointing towards Armageddon -- The Day of the Lord - when Christ gathers the armies from the surrounding nations and destroys them. Joel 2:31 says "The sun shall be turned into darkness, and the moon into blood, before the great and the terrible day of the LORD come." Notice the cosmic signs given by Joel that happen before the Day of the Lord and when this happens according to Christ. "Immediately after the tribulation of those days shall the sun be darkened, and the moon shall not give her light, and the stars shall fall from heaven, and the powers of the heavens shall be shaken" (Mat 24:29). When Christ punishes these nations, then they will know that the Lord is God (Ezekiel 28:26). Psalm 83:13 Make them like tumbleweed, O my God, like chaff before the wind. - In other words they are going to be scattered and lose their lands. - Read Psalm 35 here, David says basically the same thing and asks GOD to join him and turn the tide on his enemies. Psalm 83:17 May they ever be ashamed and dismayed; may they perish in disgrace. - In other words, not all of this force will perish in this war, they will die later and when they do die they will die in disgrace. I don't see anything here that leads me to believe this is the judging of all nations by Christ at Megiddo. Gideon, I'm glad you elaborated, because I was little confused myself. Now I see where you were going and I had actually thought of some of those arguments myself. Gideon, I understand your point, however what I see in the whole context of Psalm 83 is God's judgment where He makes them "confounded and dismayed forever" and puts them "to shame and perish that they may know that You, whose name alone is the LORD, are the Most High over all the earth." This does not sound like Israel winning a few wars with her Arab neighbors. They have already done this time and again, but the Arabs still do not acknowledge YHWH. I believe that this is God's judgment of the surrounding nations once and for all at Armageddon where Ezekiel 28:26 says Christ inflicts "punishment on all their neighbors who maligned against them. THEN THEY WILL KNOW that I am the LORD their God.'" Moreover, Joel 2:3 is not saying literally all nations on the planet. I believe this is a misconception and it contradicts what Joel wrote in Joel 3:11-12 "Hasten and come, all you surrounding nations, And gather yourselves there. Bring down, O LORD, Your mighty ones. Let the nations be aroused And come up to the valley of Jehoshaphat, For there I will sit to judge all the surrounding nations." Joel, like Zechariah, would not say all of the nations on the planet in a wooden literal sense, and then contradict themselves by turning around and saying just the surrounding nations. What they are saying per the context is that God will gather all of the surrounding nations, and Ezekiel agrees by calling them "malicious neighbors." Today they are all Islamic. Besides, I think that common sense should tell us that it is a logistical impossibility for literally all nations on the planet to surround Jerusalem. The "nation" that attacked Israel and scattered Israel is not what the focus should be per se, but rather according to Daniel 9:26 "the people of the prince that shall come" should be our focus. During the destruction of Jerusalem in 70 AD the legions that were responsible were comprised mostly of Assyrian soldiers. Though they were considered Roman because they answered to Rome, the people were Assyrian. Some do not like this fact and try to argue against it, but they are only arguing against known historical facts. By Armageddon there won't be too many people left on the planet, so many will be killed over the 7years. Plus, "all the nations" means their representative armies, and hardly every man, woman and child from each nation. I've seen the Valley of Jezreel, and Man it is huge! Over 3 billion people will die in 3.5 years. I can't even imagine that kind of carnage. But, it would be possible to have every person on earth in the valley. It's said that you could fit the entire population of 6.6 billion in, I think, Brewster county Texas, USA. It's standing room only, but mathematically it's possible. Yes it will be ALL nations, again, I will point to Joel 3:2 & 3:12 & Rev 19:19 - it doesn't state some kings or surrounding kings, it states THE KINGS of THE EARTH and their armies. Gideon says, "Yes it will be ALL nations, again, I will point to Joel 3:2 & 3:12 & Rev 19:19 - it doesn't state some kings or surrounding kings, it states THE KINGS of THE EARTH and their armies." Daniel 2:37-38, "Thou, O king, art a king of kings: for the God of heaven hath given thee a kingdom, power, and strength, and glory. And wheresoever the children of men dwell, the beasts of the field and the fowls of the heaven hath he given into thine hand, and hath made thee ruler over them all. Thou art this head of gold." Did Nebuchadnezzar rule all of Asia, and the natives of North and South America? We know the answer is no and all recorded history will prove this. Daniel 2:39, "And after thee shall arise another kingdom inferior to thee, and another third kingdom of brass, which shall bear rule over all the earth" Did Greece rule over the people of Japan, the aboriginals of Australia? India? The text says that the kingdom "shall bear rule over all the earth", but we know that the Grecian kingdom did not rule the whole literal planet. This is a fact. Dan. 7:23, "Thus he said, The fourth beast shall be the fourth kingdom upon earth, which shall be diverse from all kingdoms, and shall devour the whole earth, and shall tread it down, and break it in pieces." Many here believe this to be the Roman Kingdom, correct? However, per Daniel it was to conquer the whole earth, but this never happened. This is a fact. If you read this literally then the verse cannot be true. We are again looking at a part for a whole, or a whole for a part - a synecdoche. It is only talking about that part of the world, not the whole planet. Matt. 3:5-6, "Then went out to him Jerusalem, and all Judaea, and all the region round about Jordan, And were baptized of him in Jordan, confessing their sins." If we read this verse literally it would be saying that every single person in all Judea and all around Jordan were baptized and were saved. Again, a synecdoche. Luke 2:1-3, "And it came to pass in those days, that there went out a decree from Caesar Augustus, that all the world should be taxed. (And this taxing was first made when Cyrenius was governor of Syria.) And all went to be taxed, every one into his own city". We know that Caesar never taxed the whole planet. This is a fact that we cannot deny. Acts 2:5, "And there were dwelling at Jerusalem Jews, devout men, out of every nation under heaven." Do you believe that men out of every nation on the planet were present on the day of Pentecost? Romans 1:8, "First, I thank my God through Jesus Christ for you all, that your faith is spoken of throughout the whole world." Was the Gospel preached already to the whole planet in the first century? Romans 10:18, "But I say, Have they not heard? Yes verily, their sound went into all the earth, and their words unto the ends of the world." Same question as above. Colossians 1:23, "If ye continue in the faith grounded and settled, and be not moved away from the hope of the gospel, which ye have heard, and which was preached to every creature which is under heaven; whereof I Paul am made a minister." Was the gospel was preached to donkeys, house flies, lizards, and mice? We cannot take this literally, I'm sure you would agree. Revelation 19:19, "And I saw the beast, and the kings of the earth, and their armies, gathered together to make war against him that sat on the horse, and against his army." The "earth" is from the Greek word "ge" (G1093) and it does not necessarily have to mean the earth as a whole. It also means "a country, land enclosed within fixed boundaries, a tract of land, territory, region". When we read that Zechariah, Joel, Ezekiel call the nations at Armageddon the "surrounding nations" or "malicious neighbors" and allow Scripture to interpret Scripture, then we begin to understand that the nations with Antichrist are not all nations on the literal planet, but rather all of the surrounding countries in the region. Gideon said, "You said " As for the bulk of the Jews, outside of Israel most live in America." True, but not before the 1850's. I wasn't speaking about current populations, I was speaking of when Rome took the Jews into slavery; 70 AD." 'In the second century AD, two prominent writers from Roman Syria, Lucian and Tatian, ostentatiously identify themselves as Assyrians (Assúrios). This self-identification is commonly misinterpreted to imply nothing more than that these writers were ethnic Syrians (in the modern sense) speaking Aramaic as their mother tongue (Millar 1993, 460). It is perfectly clear from the contexts, however, that they were specifically referring to their native identity and cultural heritage, which they proudly and defiantly contrasted with the Greek culture. That heritage was Assyrian. It is worth emphasizing that while Assúrios in Roman times could refer to an inhabitant of the Roman province of Syria, it basically meant "Assyrian", nothing else. No "Syria" in the modern sense existed in antiquity. In Armenian, Parthian and Egyptian sources of the Roman period, Roman Syria is consistently and unmistakably referred to as "Assyria" (Asorik', 'swry'; 'Išr; see Frye 1992; Steiner 1993).'" Back to the Gog-Magog Battle and why it is pretty clear that it is not Armageddon, see the "Millennial Kingdom" installment of this article series and "Is Ezekiel 38-39 Armageddon?" "Did Nebuchadnezzar rule all of Asia, and the natives of North and South America? We know the answer is no and all recorded history will prove this." I don't put any stock in Beast from the East, so this is moot. Gideon said, "Mitchell, Is recorded history the word of GOD? No, besides, I have a degree in history, and show you so many examples of where historians have given wrong accounts of history. If you don't even take GOD's infallible word as perfection, then, we can't even have a conversation. In my opinion, hyou have been reading too many books by Joel Richardson..."
Are you trying to say that Nebuchadnezzar ruled the whole literal planet? Are you saying there was a time when Greece ruled the whole planet, even North and South American that hadn't even been discovered? Is it your contention that Jews from every nation on the globe were present at Pentecost? And that Caesar taxed the planet including the Mayans, and native Indians of North America? Do you believe that the gospel was preached to every living soul on the planet and brought to every tribe and people during the first century? Is it your belief that the Bible does not employ figures of speech that are not meant to be taken in a wooden literal sense? By the way, I have not read any of Joel Richardson's books. I've come to what I believe on my own through study of the Bible first and foremost. What he has had to say has served to confirm my suspicions of Islam and the Last Days. Sal said, "Sean Osborne of Eschatology Today has written a very detailed historical analysis showing Rome did indeed have the Temple destroyed."